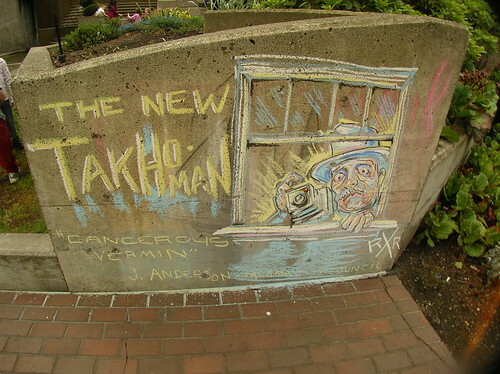 I first crossed paths with Mr. John Hathaway (aka The New Takhoman) back when Todd Matthews ran this story [The-Pen-is] Mightier than Swords in the Tacoma Daily Index profiling local Tacoma Political Cartoonists. After reading Todd's article I immediately subscribed to Mr. Hathaway's Email Newsletter and I highly recommend you do the same without haste! Happily, your in-box will be filled daily with curmudgeonly gripes keeping you informed on Tacoma things you would otherwise be completely oblivious to. Like our ex-chief of police being a homicidal maniac! The TNT wouldn't touch The Brame story with a double insulated ten foot pole till Hathaway found out about it. But Tacoma has learned it's lessons and everything old is new again. To learn more about this dusty jewel citizen agitator, I recommend this waxing Melon PODCAST conducted by our friend Electric Elliot. Excelsior! by Crenshaw Sepulveda on 8/18/2009 @ 11:06am Does me good to know John is getting his health insurance from the city of Tacoma, that must stick in their craw. by Mark Monlux on 8/18/2009 @ 11:54am I think I met this guy a few years back. Didn't he run a bowling alley? by NineInchNachos on 8/18/2009 @ 12:52pm Yeah Lincoln Lanes! I believe he was a bar tender there. by Mark Monlux on 8/18/2009 @ 7:12pm I think I loaned him some of my pulp magazines once. by NineInchNachos on 9/3/2009 @ 3:17pm ABSOLUTELY FREE AND NEW! Electric Elliot and Chris Van Vechten speak with the New Takhoman's John Hathaway about Tacoma (crazy Dale Washam, Term Limits, Martin Luther King Housing Authority Pyramid Scheme, and Tacoma City Council) in this new podcast segment: The Rotten Melon. RR Commentary: This is my favorite KUPS The Melon podcast EVER. well... Their old traveller episode would be a close second. "comment: Message for RR Anderson, has anyone heard from John Hathaway in the last couple weeks. His voice mail is full and he has not answered email. I have been concerned that he is OK. - J Hasty"
@RR_Anderson I have not heard from Mr. Hathaway since last Friday, but that doesn't really mean anything.